The Main North: Operating Cards for the Main North in 1965. Operating Cards for the Main North in 1965. Visitors to the Main North can bring their own trains to run on the layout. Return Loops at either end providing a continuous run of 115 Metres of track, gives the Visitor an extensive road test/running of their trains and they have fun. The 12 Stations/Locations are identified on the appropriate fascia. 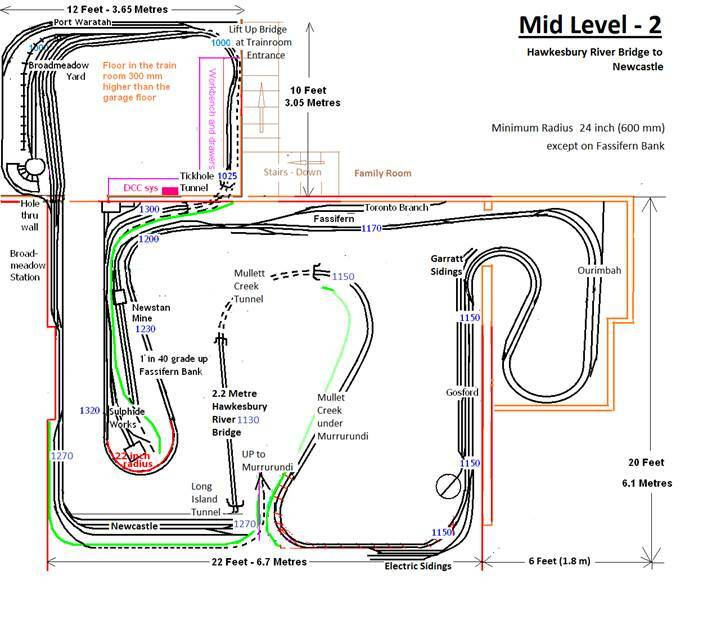 To help Operators know where they are, which way to go etc, I have attached some Track Plans shown below, to the layout's Valances. Operators at a Main North Operating Session or a Visitor that wants wants to run one of my trains, they'll have to run them as they did in 1965 with all the operations of engine changes, double heading/banking, add/remove wagons/coaches/vans etc, that were done to run the train in both directions over this 450 km section on my Main North. This includes changing over to 46 Class Electric for all southbound trains (except the 44 hauled North Coast trains), at Gosford, for the run to Sydney. The same for northbound trains out of Sydney, all will be hauled by a 46 to Gosford, where there will be an engine change to a 35s, 36s, 38s or an AD60s, heading north. To know what has to be done and to help them negotiate the Main North, I have made a business card sized Operating Card for each of my trains. To be convenient to use, they had to clipped to the Throttle as shown, providing the details of what's necessary as they follow their train around the layout. The Operating Cards are laminated with a 64 x 99 mm Laminating Pouch available from Office Suppliers. 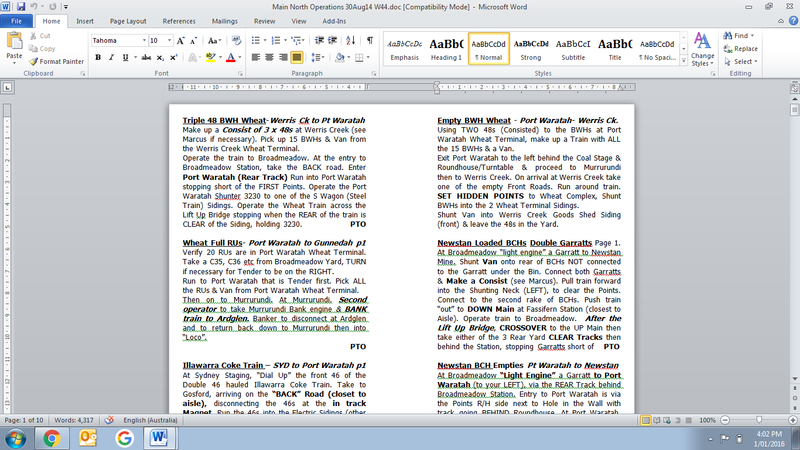 Using the many books and magazines I have collected about the NSWGR, Passenger Train Composition Book, Load Tables, Wagon Load Calculator, help from other NSW modellers etc, I was able to put together the details of running each of my trains, "1965 style". At the moment, I don’t operate to a Timetable, instead I want everyone to have fun playing trains, using the Operating Card. If and when a Timetable is implemented, each Operator will still need to use the Operating Card to run a train. For 1965 Operating Sessions the Operator takes an Operating Card from the Card Stowage "Trains to Run" Pocket (lower) located above the Workbench (shown right) and clips it to the Throttle. Using the Card, he'll run the train "1965 style" and when finished, returns the Card to the "Finished Trains" Pocket. The Operating Cards are arranged in a sequence that provides an Operating Session without too many bottlenecks etc. Note: My DCC Ammeter is shown in the fascia above the Workbench, monitoring the current to the layout. The reading of "1.12" Amps is what 33 stationary sound equipped locos, ALL quiet (no sounds), are drawing. This equates to 34 mAs each. With 6 Operators playing trains, the Ammeter displays rarely reads higher than 2.0 Amps. I recommend that ALL DCC layouts have an Ammeter installed. See my Meters for DCC web page for more details. Imagine the noise of over 30 sound locos starting up, when the layout is powered up, what a racket, so ALL locos are programmed to be QUIET until they are operated. 75% of my locos (Soundtraxx and QSI equipped ones), will automatically mute after a time of inactivity, minimizing the "idling" locos, after the Operator has finished running the train, and they forget to mute the loco (F8). 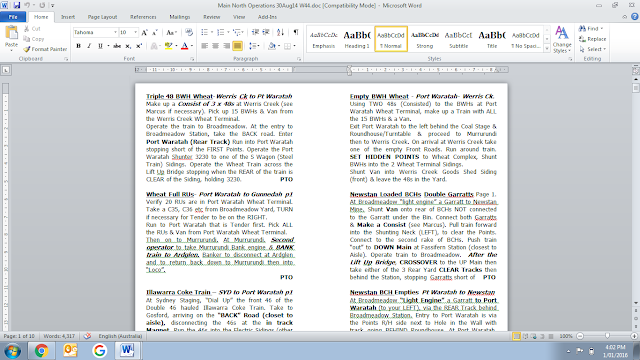 Using M/S Word, a page is divided into two columns, the width adjusted to the width of the business card as shown below. I wrote the details on how to "operate' each of my staged trains. If the text was more than 12 lines, I made a second page, placing the text in the appropriate place to provide text on both the front and back of the Operating Card, when printed as shown on the Glen Innes Mail Operating Card below. I have used Tahoma font with "10" size, providing easy to read text, even without my Reading Glasses. The highlighted text, in the Glen Innes Mail's Operating Card indicates there are 12 "operations" to be carried out while operating this train from Sydney Staging to Tamworth and back to Sydney. Obviously not all trains travel this far and don't have this many "operations". I use normal A4 paper not cardboard due to laminating the Card. As I operate in 1965, steam locos were still the primary form of traction on the Main North, north of Gosford. The tonnage of the loads were calculated for the Ruling Grade for that section. Using the appropriate Load Tables and a Wagon Load Calculator, I “weighed” my trains to keep them within the Load Table specification. I did a Presentation on this topic at the 2015 Epping Seminar. Click here for the Presentation. A few trains like the "269 Pick Up" have shunting activities but there is more than enough shunting necessary with the Newstan Full and Empty Coal Trains, the W44 Concentrate, the Full and Empty Wheat trains, the Illawarra Coke train etc. The addition of the engine "operations" makes for an even more complex running exercise for most trains that takes a long time to complete and is lots of fun. Many trains are "through" trains. Depending on the trains, it can take up to 60 minutes to run a train. Imagine how tired an Operator can get after walking up to 450 kms (or 900 kms if he returns), as he follows his train, changing engine etc. A “Crib” break can be taken anytime, just leave the train in an appropriate Loop/Siding so as to not block the main line. If you need someone to have a chat with, turn of the Master Power Switch and announce “Coffee” but be aware of calls like "what's happened, my loco has stopped" etc. Layouts need plenty of Staging Areas to store the trains, complete with loco. I have 3, soon 4 Staging Areas, to store my trains. To see one of my favourite "operations" that has to be done on many DOWN Goods trains as they are run to Werris Creek, including rear end banking up to Ardglen, click on the below video. Marcus, thoroughly enjoyed your banking video. You have come a long way on your layout with scenery. I hope my layout will turn out as appealing to look at, run and operate as yours. Regards, Gary Ible. Hi Gary. Thanks for the compliments. Rear End Banking at this location was one of the reasons I chose to model the Main North, now through scenery it is so much more enjoyable. Regards Marcus.